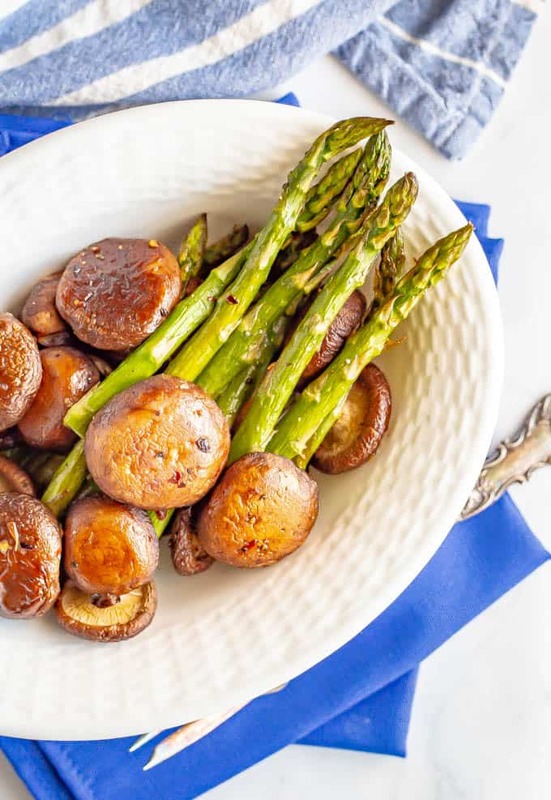 Roasted asparagus and mushrooms is a simple but delicious veggie side dish with just 4 ingredients. Plus, it’s ready in just 15 minutes! So, it snowed here in N.C. on Tuesday. 😳 In April. It was the only snow we’ve gotten all year! It lasted for less than a half-hour, nothing stuck, but it was still pretty fun! So you guys know I go on overload with asparagus when springtime hits, right? 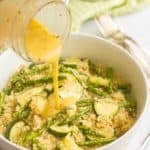 My steamed lemon butter asparagus, quick and easy asparagus almandine, easy sesame asparagus, and asparagus with peas and basil are all favorites. 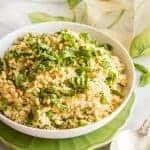 Today’s recipe is inspired by an appetizer I had with my mom at a local Spanish tapas restaurant. 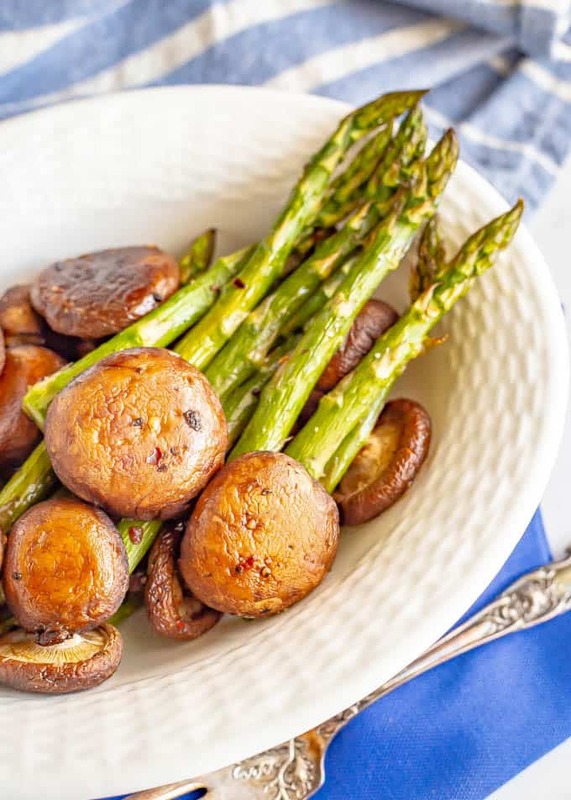 The roasted asparagus and the wild mushrooms were served over a small pool of romesco sauce, which we enjoyed but decided wasn’t really necessary. 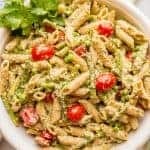 So today’s recipe is a little bit simpler but every bit as flavorful! 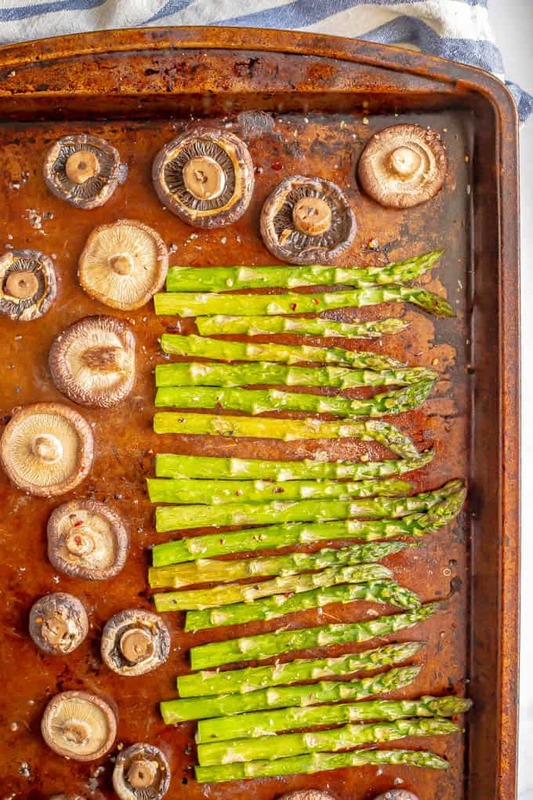 You’ve got the bright, fresh flavors from the asparagus and the earthy notes from the mushrooms. It’s topped with a sprinkling of grated parmesan cheese for a nuttiness that just finishes everything off! Now, I’ve got a few tips and tricks to share on making these roasted veggies. Just trying to be helpful. The roasting time here really depends on the thickness of your asparagus. Thin ones will cook more quickly but larger, thicker stalks can take a few minutes longer. 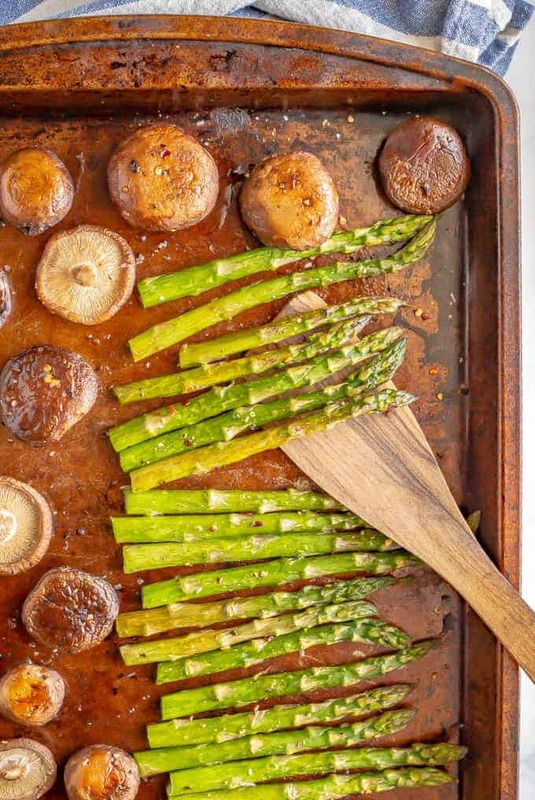 If you like very tender asparagus, or want more browning on the veggies, roast them for up to 15-20 minutes. 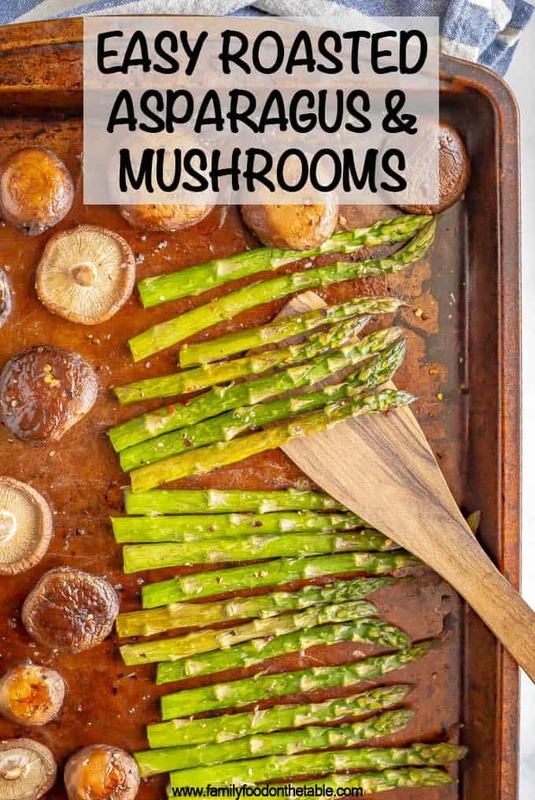 Wild mushrooms have a great earthy flavor, but if you can’t find any, cremini mushrooms, shiitake mushrooms or baby portobello mushrooms work great here, too. – First, pay attention to the recipe. Some recipes require the very thin stalks of asparagus. Others may want a heartier, thicker bunch of asparagus. – Either way, be sure to choose a bunch of asparagus that’s plump and firm (not limp). The tips of the asparagus spears should be closed. 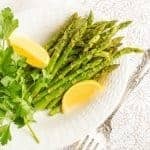 – The asparagus should be brightly colored, not faded. Once you’ve purchased them and brought them home, asparagus should be stored in the refrigerator. I like to roast the mushrooms whole with the stem side up. That way, the moisture that they give off collects in the cups and you can dump it afterwards. 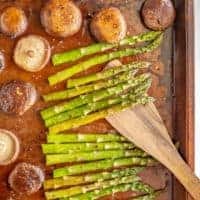 Otherwise, the extra water that’s released from the mushrooms gets all over the baking pan and makes the veggies a little soggy, I think. You could also halve the mushrooms or thickly slice them before roasting if you’d like. These veggies are a great side with steak or pork, like my herb roasted pork tenderloin and potatoes. They’d also be delicious as a side dish for a whole roasted chicken or my honey butter chicken or mozzarella baked chicken. 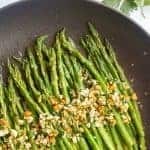 I hope you give this easy roasted asparagus side dish a try. 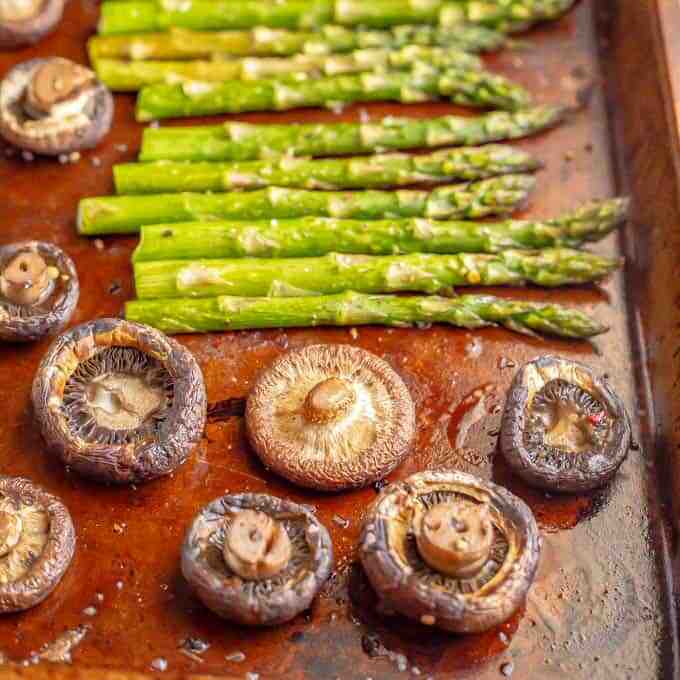 Combine asparagus and mushrooms on a large sheet pan. 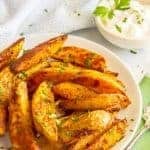 Drizzle with olive oil and sprinkle with salt, pepper and red pepper flakes, if using. Toss to get the vegetables well coated. Serve hot, with a sprinkling of Parmesan cheese, if desired.